Anthony Hunt's career spans six decades of British architecture. From when he first began to practice as a structural engineer in the 1950s until he retired in 2002, he worked with nearly all the acclaimed British architects of the time. He is perhaps best known for devising clever solutions for the system-built prefabricated buildings popular in the 60s and 70s. His genius lay in how he re-imagined the possibilities of industrial design. He envisaged structures as being composed of batch-produced components  a system similar to the approach used in furniture manufacture but taken to a larger scale. This approach was well received by architects in this country up to around the mid 1980s, when system-built prefabricated buildings were in vogue. 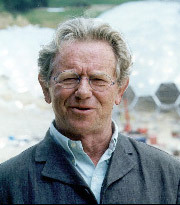 Later in his career, after a period in which the design focus was elsewhere, his vision and experience enabled him to help architects realise a series of spectacular structures, such as the Eden Project. Owen WIlliams, Ove Arup (1895-1988) and Felix Samuely (1902-59) were first in a line of engineers working in Britain who adopted a bi-disciplinary approach to collaboration with architects. Anthony Hunt belongs to the next generation that took this approach, a generation that includes Frank Newby (1926-2001), Edmund Happold (1930-96) and Peter Rice (1935-92). Rather than styling himself an architect-engineer of the old school, Hunt strove to apply his insight in the service of the architectural visionaries of his day. His fluency with industrialised production and his capacity to produce highly engineered components that delivered sound structural results contributed to the brisk clarity of the High Tech, Modern and Post Modern movements in this country. 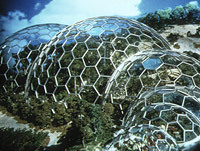 Illustration of the biome structures for the Eden Project (1998-2001).